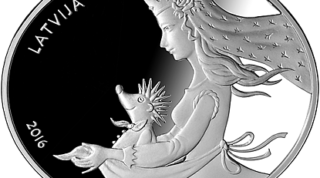 As the first commemorative collector’s coin released in 2016, the Bank of Latvia has chosen to continue the Fairy Tale (‘’Pasaku monēta’) series (the first release – ‘Pieci kaķi’ was released in 2015), this time producing a coin inspired by the Latvian folk fable ‘Eža kažociņš’ (Hedgehog’s Coat). ‘Eža kažociņš’, the story of a hedgehog that, regardless of his small stature, is able to herd pigs in the forest. The hedgehog, using his cleverness and bravery, marries the princess and he himself turns into a prince. One of the most popular variations of the story was by Vilis Plūdonis in 1921, as well as poet Māra Zālīte’s interpretation in 1991. The oval shaped coin, minted by UAB Lietuvos monetų kalykla (Lithuania), was designed by Gundega Muzikante, and the plaster model was created by Ligita Franckeviča. The silver proof quality coin has a mintage of 10,000 and has a nominal value of 5 Euro. This is not the first time the hedgehog has appeared on Latvian currency – a special 1 Lats coin was produced in 2012. For further information, please visit the Bank of Latvia Collector’s Coin website.